Japanese runner Rei Iida has won praise for her never-say-die attitude after completing her stage of a marathon relay on her hands and knees after fracturing her leg in a fall. 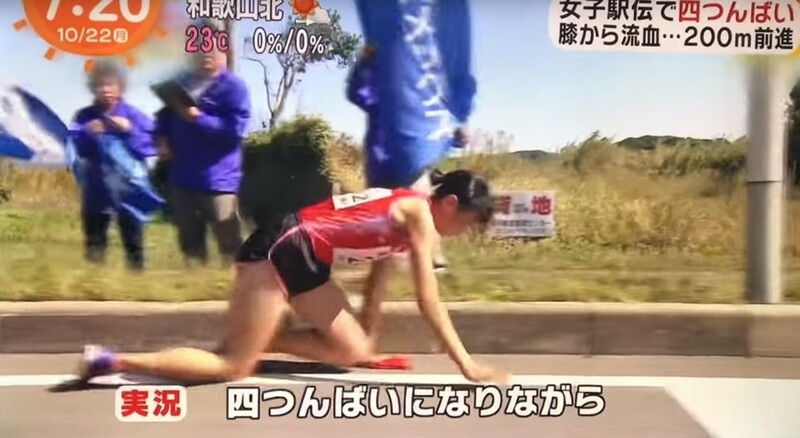 The 19-year-old university student was seen crawling the final 700ft of the 2.2-mile section of her section last weekend in the Iwatani Sangyo corporate 'ekiden' race in Fukuoka Prefecture. Footage showed the moment the doughty runner fell, fracturing her right leg, before desperately crawling on with the red relay sash in her hand. Her teammate can be seen wiping tears from her eyes as she waits patiently for the heroic Iida, who agonizingly reaches her to hand over the relay sash. Iida is then helped up by an official before slumping back to the floor, her legs bearing blood and bruises from her excruciating bid to complete her stretch of the race. Organizers of the event have come under fire for not stopping the runner, although she had reportedly asked “how many meters are left until my goal?” when approached by a race judge. She was taken to hospital after the race, and the fracture is expected to rule her out of action for around four months.